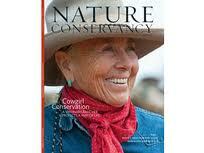 Ranchers and The Nature Conservancy working together? It sounds like a case of odd bedfellows. But in the decades she’s been running the Dugout Ranch, Heidi Redd has always done what was best for her ranch and her livestock. So back in the late ’90s when her divorce from husband Robert Redd meant the ranch might have to be sold, she approached The Nature Conservancy to see if they were interested in purchasing the ranch and allowing it to continue functioning as a working livestock operation. They were interested, and that was the start of their partnership. Now in her seventies, Heidi and the Nature Conservancy are working together on research that will provide answers about how to protect grasslands and ranching as the climate changes. Redd says that the biggest changes she’s seen in her 40 years running the ranch are the increase in visitors and the shifting weather patterns. She attributed the fact that her cattle herd is now only half the size it once was to shifts in the climate saying, “There is less moisture, hence fewer forage plants, and the water holes dry up earlier in the season.” She hopes that the scientists from The Nature Conservancy’s “Canyonlands Research Center” will be able to provide ranchers with information on how to reduce invasive species and their spread, and, if forage plants are stressed due to drought, when to graze them and for how long. Check out the video for more on the partnership. Even if you’re not interested in the work, enjoy the beauty of the ranch. It’s in one of my favorite places on the planet, and if you’ve watched any westerns lately, you might recognize some of the landmarks. I brought my canvas tote to the market. Who cares?